Nicole's Needlework: Sleep? What's that?? My mom called today and she asked if I slept any. What kind of question is that?? Of course not! Maybe two, three hours at a time, which I'm grateful for, but I know my nights of sleeping nine to ten hours are long gone for awhile! Wednesday I went to the Doctor and he checked me. He said I was three centimeters. He then asked how I felt about being induced. I said normally I'd say no, but we are moving and on a time crunch. He said he'd call over to the hospital to see when they could do it. He came back in and said "Today, Saturday, or Monday." Well obviously I said "Today!" Dh wanted Saturday, but I was able to convince him it would be better to do it that day. I went to the hospital about 12 pm and they hooked me up to the monitor and while I was laying there I actually started having contractions on my own, so it may have been that day anyway! Between 3 and 4 pm the nurse started me on Pitocin and the Midwife came in around 5:00 pm to check me and break my water. She said I was at four centimeters. Well, after that the contractions started coming right on top of another and very painful! I was having to breathe through them and asked to get my epidural. Right before 7:00 (we were watching Seinfeld) the Midwife came back and asked if I was having any pressure and I said yes. She checked me again and I was completely dialated. She was amazed at how fast I went from 4 to 10 centimeters. I knew those contractions were pretty strong!! 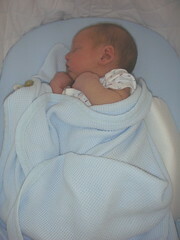 Matthew - Three days old. 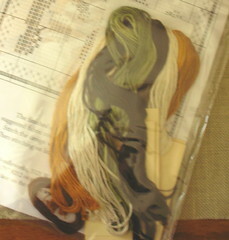 LHN Pear chart, 28 ct. Summer Khaki fabric, & Crescent Colours threads. That is a cute little piece. Something to give you a little peace from time to time. I'm so glad to hear things went so "easy" for you. Hugs. That must have been some surprise when they decided to induce you. He is a pretty baby :-) I bet Pear Tree Inn (is that what it is called?? LOL) will be done in no time! Oops - my boo boo - I thought the chart you got was Pear Tree Inn... I guess I shouldn't read blogs at 1 AM!! Oh, he is the sweetest little thing. He's beautiful. I couldn't believe you were already posting and thinking of stitching. But then again I have never had kids so this could be normal :) I hope you are doing well. Ann. 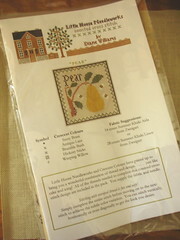 I'm stitching the Pear from LHN right now too. It's a quick stitch. Just right for a new mom who isn't getting much sleep.